Be versatile. That is key. Do more than one thing, experience more than a solitary feeling. Depth, breadth, and a little bit of good fun are essential. Knowing that we are a rambunctious people who rarely remain stationary for long, Klim has taken all of this into consideration. Built for just about any occasion, the new Klim Transition Pants are the most vastly accommodating layering option that Klim has ever made. Whether worn around the house, while grinding away in the garage, or on a go-getter ride through the wilderness, these pants are ready for it all. Lightly insulated with a soft, brushed, micro-fleece lining, the interior of the pants do wonders not only to keep you warm, but also to keep you comfy! Who doesn’t like micro-fleece? You are right, the answer to that is “nobody.” Though designed as a mid-layer, these pants are ready to function in multiple capacities once you are off of the bike. 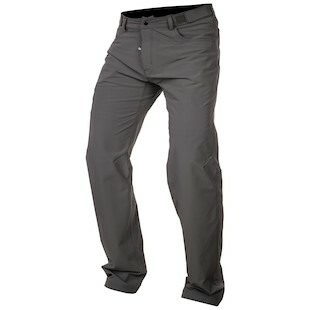 With durable nylon spandex utilized for the shell, these pants will move with you comfortably as you navigate your motorcycle trip… or just your day in general. If you are the type of rider who is in constant motion and with little time to slow down, you need gear that handles activity as well as you do. Set aside lesser options and transition into the newest option for mid-layers from Klim.